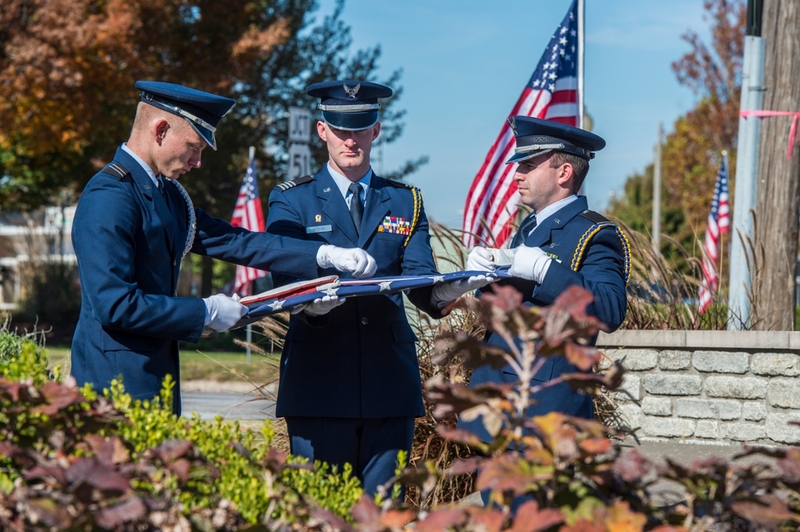 CARBONDALE, Ill. — Southern Illinois University Carbondale and the city of Carbondale will host a joint Veterans Day ceremony on Nov. 11 at the Veterans Memorial Plaza in Carbondale. Retired U.S. Army 1st Sgt. John P. Okerson of Harrisburg will give the keynote address. The event starts at 2 p.m. and is open to the public. The ceremony honors veterans of all American and foreign wars, conflicts and military operations. Meera Komarraju, SIU Carbondale’s interim provost and vice chancellor for academic affairs will provide opening remarks and Carbondale Mayor John “Mike” Henry will present the Veterans Day proclamation. Reporters, photographers and camera crews are welcome to cover the event, including the 24-hour silent vigil that precedes the ceremony. SIU Carbondale Air Force and Army ROTC staff members and participating cadets will be available for interviews at the conclusion of the ceremony. Contact Mary Kappel, U.S. Air Force ROTC office manager at SIU Carbondale, at 618/453-2481 or mkappel@siu.edu to arrange for interviews. For the 24 hours preceding the ceremony, a combined operation of nearly 100 members of the university’s Air Force and Army ROTC will conduct a timeless tradition honoring those who have served. Cadets will stand a silent vigil beginning at 9 a.m. on Nov. 10 at the Old Main Flagpole in remembrance of the nation’s prisoners of war and those who remain missing in action. The guard change occurs every 15 minutes until 9 a.m. Nov. 11. Okerson retired from the U.S. Army in August 2013 after more than 20 years of service. He held various assignments throughout his career both in the United States and overseas. He was also assigned multiple times for humanitarian operations within the United States and abroad. Bronze Star Medal with two Oak Leaf Clusters. Meritorious Service Medal with three Oak Leaf Clusters. Army Commendation Medal with five Oak Leaf Clusters. Army Achievement Medal with seven Oak Leaf Clusters. Humanitarian Service Medal with star. Iraqi Campaign Medal with three campaign stars. Afghanistan Campaign Medal with two campaign stars. Global War on Terrorism Service and Expeditionary Medals. Okerson and his wife Crystal are the parents of three daughters and have a granddaughter. He works for U.S. Postal Service as a letter carrier and also as a part-time fitness instructor at Reform Gym in Harrisburg. He serves as a volunteer with the Marion chapter of Team Red, White and Blue, an organization that connects veterans to their communities through physical, service and social activities. He is also active with the American Legion, Veterans of Foreign Wars, the Veterans Honor Flight of Southern Illinois and the Wounded Warrior Project.